Recipients come from the worlds of science, art, academia, industry, politics, medicine, entertainment and include former staff and students. Honorary graduates include Duncan Bannatyne OBE, entrepreneur / Stephanie McGovern, BBC business journalist / Bob Mortimer, comedian / Rob Smedley, head of performance engineering, Williams F1 / Baronness Tanni Grey-Thompson DBE, Paralympian and parliamentarian / William Tillyer, international artist / Keith Williams, British Airways chief executive. Robert is the former President of Slippery Rock University in the United States where he established dozens of international partnerships. His personal involvement and commitment has seen hundreds of staff and students gain immeasurably from living and working in different cultures. A pioneer in the move to open up access to higher education, Beverly is a well known figure in educational circles. As a freelance broadcaster, she has presented numerous television and radio programmes including Sixty Minutes and Horizon. Sandy Anderson was, until January this year, Chair of the University Board of Governors. He is Chair of Tees Valley Local Enterprise Partnership and among many other roles, former Senior Vice-President (Technology), ICI, and former Chair of DigitalCity, Ensus UK and Teesside Tomorrow. Alistair is a successful businessman with an involvement in a variety of local enterprises, including OneNorth East and the Tees Valley Partnership. He is Chairman of New Century Enterprises. He also has a number of non-executive directorships including Chairman of Steelite International PLC and is an active Business Angel with both Hotspur and Seraphim Development Capital. He is a Director of the British Business Angels Association. Trevor Arnold is the former Managing Director of Thornaby-based K Home International where he spent 21 years securing contracts for Teesside. These contacts included the development of an 800-bed hospital in Abu Dhabi, as well as work on Dubai’s Atlantis Hotel – the world’s second seven-star hotel. Trevor saw the company win two Queen’s Awards for outstanding achievement in international trade. Jane is Operations Director at Cape plc and former Vice-President (Utilities) of Sembcorp. In 2004, she became the first woman in the world to manage a blast furnace – the Corus cast house at Redcar – and she was also only the second woman in the world to have ever managed a coke oven. Jane has been named the Confederation of British Industry’s (CBI) "First Woman" and she is currently a member of the University’s science and engineering advisory board. Entrepreneur, Duncan has been part of BBC2’s Dragons' Den since the show was first screened in January 2005. Aspiring entrepreneurs pitch for investment from five venture capitalists willing to invest their own money in exchange for equity. Born in Clydebank, Scotland, Duncan began his entrepreneurial life by car trading, but an ice cream van purchased for £450 changed the direction of his life. He eventually sold the business for £28,000, founding a nursing home business which he then sold for £46 million. He has since expanded into health clubs with the Bannatyne's chain, and also owns bars, hotels and property. In 2004, he was awarded an OBE for his services to business and charity. Richard Barker is Chairman of furniture company Barker & Stonehouse. He joined the company (co-founded by his father) in 1960 and, under his leadership, it has grown to be a major national employer and a leading retailer in its field. It is the largest family-owned furniture company in the UK. Before becoming a novelist Pat taught History and British Constitution at a further education college in the north east. She has a powerful record of achievement in her field, was one of 20 Best Young Novelists in 1983 and runner up for the Guardian Fiction Prize. Her novels have a strong sense of place, which is often recognisably Middlesbrough. Thelma is fondly remembered throughout the UK for her role as Mavis Riley in Coronation Street, whom she played for nearly 2,000 episodes over 26 years. Her next major role after Coronation Street was Dolly Bellfield in Victoria Wood’s Dinnerladies, a role that was written specifically for her. Thelma has also appeared in Fat Friends, The Royal, Marple and Midsommer Murders. Last year she appeared as the villainous Lady Thaw in Doctor Who and in 2005 she appeared in her first film Mrs Henderson Presents and was nominated for Most Promising Newcomer in the British Independent Film Awards. John is President and Chief Executive Officer of US-based global design consultancy TEAGUE. John studied at what was Teesside Polytechnic, graduating in 1988 with a BA (Hons) Three Dimensional Design – Industrial Design. He dedicates his time to building on TEAGUE’s heritage, strengthening partnerships with some of the world's leading brands including Intel, Starbucks, Boeing and Samsung and pushing TEAGUE’s longstanding mission ‘to build a new and better world’ into the 21st century. Trevor was the inventor of the world famous clockwork radio, which was featured on Tomorrows World in 1994. The clock's potential was recognised by Christopher Staines, and Roy Steer, who jointly acquired funding to set up Power Industries in Cape Town, employing disabled workers to manufacture Trevor's creation. Les is attributed with being the man who almost single-handedly introduced the concept of convenience stores into Teesside. A leading public figure on the Teesside business scene, Les' other offices include President of Teesside TEC, Director of Teesside Tomorrow and Patron of the Cleveland Community Foundation. Steve's artistic career began at Teesside College of Art & Design. He began work as a graphic designer for ICI and then went to Leeds for a Fine Art degree but it was on Teesside that he first developed the radicalism and artistic skills that helped him become one of the most effective contemporary cartoonists in Britain. Mark Benton is an actor know for many roles including Early Doors, Northern Lights and Barbara. He has recently toured the UK with Hairspray the Musical and made his dancing debut on BBC's Strictly Come Dancing. Mark comes from Grangetown. Sadly now deceased. Baroness Blatch was Parliamentary Under Secretary of State in both the Departments of Education and Environment. She was a regular visitor to the region and was the former Minister with special responsibilities for overseeing government programmes on Teesside. Asa (sadly now deceased) went to Cambridge University where he gained First Class degrees in History and Economics. He returned to Academic life after the Second World War and was the first historian to devote serious attention to the history of Middlesbrough in his book Victorian Cities (1963). Lord Brittan (sadly now deceased) was the first ever Chancellor of the University of Teesside from 1993 to 2005. He was Vice-Chairman of UBS Investment Bank and previously served as European Commissioner following a distinguished parliamentary career. Lord Brittan was elected to the House of Commons in 1974 as Member of Parliament for Cleveland & Whitby and in 1983 for Richmond. He served as Minister of State at the Home Office, Chief Secretary to the Treasury, Home Secretary and Secretary of State for Trade and Industry. Lord Brittan was knighted in 1989 and became a life peer in 2000. Moira was Chief Executive of the Tees and North Yorkshire NHS Trust from 1999 to 2006. She was awarded the OBE in 2003 and served as Chair of the County Durham and Tees Valley Workforce Development Confederation. She also served as a member of the Executive Group of the National Mental Health Partnership. In 2006 she won the Kate Smythe ‘Making a Difference Award’ from the National Mental Health Partnership. Roy was Deputy Chief Executive of the Tees Valley Training & Enterprise Council and also Director of Lifelong Learning, he has made a key contribution to education and training achievement in the Tees Valley. Ray, sadly now deceased, was Dean of Computing & Mathematics at the University when it gained its ‘Excellent’ grading for teaching Computer Science – he’s one of the best known names in Higher Education computing. Howard Burch is a renowned television producer, who is behind many television shows and films. He has been a Drama Executive at Channel 4 and is presently Executive Producer at Kudos. His television credits include Spooks, Hustle, Ashes to Ashes, Moving Wallpaper and Echo Beach and film credits include Pure starring Kiera Knightley. Howard is a great supporter and contributor to the University’s School of Arts & Media. Graeme is an alumnus of the University, graduating with a BSc Chemical Engineering. He is Senior Vice-President Fuel Optimisation of Delta Air Lines with responsibility for Delta's global jet fuel supply as well as the integration of the Monroe Refinery into the Delta supply chain. He was previously Senior Vic-President of Total Petrochemicals. Graeme is one of the most influencial people in his field. David is a leading political analyst and Professor of Politics at Ruskin College, Oxford. A prolific publisher, he has been involved in the study of every general election since 1952. He was made a CBE in 1991 and a fellow of the British Academy in 1994. Mary (sadly now deceased) was the founder of Butterwick Hospice Care Trust, which she set up after her husband, John, died of a brain tumour in 1979. It was the north east's first hospice and brought palliative care to Teesside and led to a purpose built hospice being constructed. Mary won various accolades including the Tees Valley Woman of Achievement award, Freedom of the Borough of Stockton on Tees and an OBE in 2003. Jim Caldwell is a leading global academic in mathematical modelling. He gained his PhD here and also his Doctor of Science (our most senior academic award). He has worked both in industry and academia and was recently made an Honorary Professor of the Open University of Hong Kong. Middlesbrough-born Elizabeth trained as an actress with the National Youth Theatre which led to extensive theatre and television work, including Boon, Goodnight Sweetheart and Barbara. Sir Peter started his working life as a carpenter and went on to Chair the North East Strategic Health Authority until October 2011, when it was re-shaped under government reforms. He has held the Chairmanship of NHS organisations in the region since 1990. Sir Peter has now been appointed to the Chairmanship of a new national NHS organisation. From 1984 to 1990 he was head of the Government City Action team in the North East. Prior to that he held a senior position in the diplomatic service. Sir Peter was a founding director of the conciliation service ACAS and has served in various government bodies, including as Director of the Commission on Industrial Relations, and as a special adviser to the pay body NBPI. Bob was born in the Tees Valley and began a career in horse racing at 15. In 1979 he was diagnosed with cancer and given eight months to live. He fought the cancer and his determination paid off when in 1981 he won the Grand National riding Aldaniti. His story was fictionalised in the 1983 film Champions in which he was portrayed by John Hurt. Bob retired from racing in 1983 having won some 500 races and in the same year received the MBE. He founded the Bob Champion Cancer Trust, which to date has raised over £13 million for cancer research. Teesside graduate and internationally successful opera singer Susannah has made numerous major public appearances and is Company Principal with English National Opera. In 2002 she was made Ambassador for Middlesbrough. Born in Middlesbrough, Brian (sadly now deceased), played football for Middlesbrough, Sunderland and England during his career. Brian was also an outstanding manager of Hartlepool United, Derby County, Brighton & Hove Albion and Nottingham Forest football teams. He spent 18 years managing Nottingham Forest, winning the European Cup twice. Teesside graduate Steve Cochrane is the managing director of Psyche, the internationally renowned designer clothing store, first founded in 1982. The Psyche store is based in central Middlesbrough and has established an expanding global customer base, gaining customers in the USA, Japan and Australia. Steve has an unreserved commitment to the Tees Valley, as shown by his investment in Middlesbrough. Katherine learned to row on the River Tees at just 14. In 2011 she won a gold medal at the U23 World Championships with a world record time before being one of the first ever British women to win a rowing gold medal at an Olympic Games. She has since broken the world record in the lightweight double scull, won several gold medals at the World Rowing Cup series, a silver medal at the World Championships in 2015 and represented Team GB in Rio in 2016. The County Durham actress, author and TV presenter is most well known for TV comedy favourites such as And Mother Makes Five and Butterflies or more recently in ITV's new adaptation of The Forsythe Saga. Her career spans West End productions and film roles, and Wendy has written seven children's albums and several Christmas songs. Baron Crathorne is Lord Lieutenant of North Yorkshire and member of the House of Lords, where he is a member of the Works of Art Committee. Among many external roles he is the Chairman of Trustees of the Captain Cook Birthplace Museum and Chairman of the Lord Chancellor's Advisory Committee on Justices of the Peace, North Yorkshire. Since winning the string section of the first BBC Young Musician of the Year competition, Caroline has worked in a variety of musical genres from solo classical performances worldwide to pop collaborations with Sinead O'Connor and Simply Red. Caroline recently provided the music for the film Hillary and Jackie - playing all Jacqueline Du Pre's pieces. After an apprenticeship as an electrician, Wally sought fame in London's theatre land and worked as a stage manager and actor before deciding he was more suited to writing. He's since produced over 100 plays for radio and television as well as 30 sitcoms and episodes for Casualty and Byker Grove. Alan comes from Billingham. He was appointed Chief Executive of the Arts Council England in 2007. Prior to this he was Director for Culture at the Department for Culture, Media and Sport, having previously worked in the Department as Head of the Arts Division. Alan is a passionate advocate of the role of art in university and public life. Maurice Dawson (sadly now deceased) was chairman of AV Dawson Ltd, specialists in logistics, transport and freight. Maurice’s father founded the company in 1938, in central Middlesbrough. Maurice became managing director in 1971, and grew the company over four decades. AV Dawson Ltd now employs 240 people and has built award-winning facilities at Dawson’s Wharf on Teesside. Teesside-born, Sir Liam has been the Department of Health’s Chief Medical Officer since 1998. He was previously Regional Director and Director of Public Health, Northern and Yorks NHS Executive. He received a knighthood in 2002. Monica is a Middlesbrough-born actor and writer. She is perhaps best known for her role as straight-talking Senior Comms Officer Tracey Pritchard in W1A, but has also starred in a number of films including Alan Partridge: Alpha Papa, The Falling, The Arbor and Eye In The Sky. Her solo play, The B*easts, found critical and audience acclaim at the Edinburgh Festival Fringe in 2017 where it won the Stage Edinburgh Award, before transferring for a successful run at the Bush Theatre, London, attaining an Olivier nomination in 2018 and, more recently, a nomination for the South Bank Sky Arts Award 2018 for Breakthrough Talent. Skin was the lead singer of Skunk Anansie during the 1990s - with hits like Hedonism and Weak. Now a solo artist, she released her debut album Fleshwounds in 2003. Skin graduated from Teesside Polytechnic in 1989 with a BA (Hons) degree in Interior Architecture and Design. Teesside-born actress Elizabeth is a regular face on our TV screens as Woolpack landlady Diane Sugden in Emmerdale. She has made many TV appearances throughout her career including Carol Boswell in the 1970’s sitcom The Liver Birds and her diverse stage work includes a year in London’s West End as Shirley Valentine. Elizabeth was Director of the Victoria and Albert Museum where she instituted several successful exhibitions as well as expanding the museums educational role and creating the Research Department. She was made a Dame in June 1995. A renowned journalist, publisher and editor, Harold has had a prolific career in journalism including posts from Editor of the Darlington-based Northern Echo to Editorial Director and Vice-Chairman of the New York Daily News. Rona Fairhead is Chairman of the BBC Trust. She is a Cambridge and Harvard Business School graduate and a non-executive director of HSBC. Rona spent many years working in the Tees Valley as executive vice-president for Strategy and Finance of ICI. Margaret is Chairman of the Regional Development Agency One NorthEast. Before joining One NorthEast, she had a 22-year career with Tyne Tees Television, including six years as Managing Director. Margaret is also a former member of the University’s Board of Governors. Based in County Durham, children’s author Anne was the Children’s Laureate 2001-03 and has held the Carnegie Medal and the Publishing News Children’s Author of the Year and received the Whitbread Award in 1993 and 1997. Her 1987 novel Madame Doubtfire was adapted for the big-screen as Mrs Doubtfire starring Robin Williams and her book, Goggle-Eyes, was adapted for BBC children's television. John has an outstanding record of public service in the Tees Valley, having served as Chief Executive of Middlesbrough Council, Chair of South Tees Hospitals Acute NHS Trust and as a Governor of the University of Teesside. He has served as a board member of the Housing Corporation and of many public bodies and charities. He retires as University Visitor in March 2008. The Senior Circuit Judge and Recorder of Middlesbrough is a highly eminent member of the legal profession who has served the community of Teesside for many years. A previous Vice Chancellor of the University and now Emeritus Professor. Professor Fraser served both the University and the Tees Valley community for ten years and presided over the £60m transformation of the campus which resulted in the University in its present form. Born in South Bank, Middlesbrough, Vin’s career as a musician began in 1963, aged 15, when he first sang in Teesside folk clubs. He has been Teesside's roving ambassador of folk music for nearly 30 years, performing in the Unites States, Canada and Europe. The people and culture of Teesside and North Yorkshire largely inspire his songs. Born in Redcar, Jane is the author of many novels and collections of short stories, both for children and adults. Her novel, The Queen of the Tambourine, won her the 1991 Whitbread Best Novel of the Year. Other novels include God on the Rocks, which was televised in 1992 and The Flight of the Maidens. John is Emeritus Professor of the First Year Experience Centre at the University of South Carolina, USA. He is a long standing collaborator with the University through a partnership which gives the University's students the opportunity to take part in an annual student exchange scheme. Tees Valley educated Shiulie’s career in journalism began at local radio station BBC Radio Cleveland. She is now Home Affairs Editor of ITV news and in 2001 won the BT Emma Best Television News Journalist Award. Steve Gibson is Chairman of Middlesbrough Football Club. Steve's successes at the club include visiting Wembley three times and creating the new 35,000+ Cellnet Riverside Stadium. He is also a successful international businessman. The highly eminent sculptor and installation artist is the creator of Gateshead’s the Angel of the North, which was fabricated in the Tees Valley. Antony was awarded the Turner Prize in 1994 and an OBE in 1998. Professor Charles Greenough is Consultant in Orthopaedics at South Tees Hospitals NHS Foundation Trust. He is Chairman of the Education Committee of the Spine Society of Europe and Visiting Professor of Spinal Studies at Durham University. He is the first ever national clinical director for back disorders and is a national leader in his specialism. Philippa Gregory is the best-selling author of historical novels who now lives on the North York Moors. She holds a doctorate in 18th-century history and early in her career lectured at Teesside University. Her many novels include A Respectable Trade, adapted by the BBC, and The Other Boleyn Girl, adapted again for television by the BBC, and later as a Hollywood film starring Scarlett Johansson and Natalie Portman. Her TV appearances include being a Tudor expert on Channel 4’s Time Team. She also runs a small charity which builds wells in school gardens in The Gambia. Bill (sadly now deceased) was a former head of Department of Mathematics and Computing and was one of the architects in developing higher education on Teesside. He was largely responsible for Teesside's excellent reputation for Computing from the 1960s onwards and helped launch Teesside's first degree in Computer Science in 1966. He was honoured by the school he helped develop when the building was renamed as The Greig Building in 2001. Tanni is Britain’s best-known Paralympics athlete, having performed at world-class level for the past 13 years. She won four gold medals in the 2000 Sydney Paralympics and in 2001 was admitted to the World Sports Academy, alongside sporting legends including Pele, Ed Moses and Boris Becker. Baroness Tanni Grey-Thompson is Britain’s best-known paralympic athlete having performed at world-class level for the last 13 years. By the end of her paralympic career in 2007 she had achieved 16 medals, 11 gold, four silver and a bronze. In 1993 she received an MBE for services to sport, in 2000 the OBE, again for services to sport and in 2005 made a Dame Commander of the Order of the British Empire. In 2010 she was created a life peer. 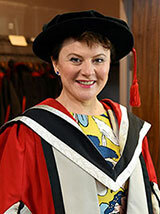 She first received an honorary Master of Science award from the University in 2001. Tanni continues to play an active role within sports administration; she is a non-executive member of the board of UK Athletics, and the board of the London Marathon and is Honorary President of Sports Leaders UK. Richard (sadly now deceased) was born in Thornaby, studied drama at Stockton and Billingham College and has gone on to a distinguished stage, screen and television career. Richard has been awarded the Laurence Olivier Award for Best Actor, the Drama Desk Award for Outstanding Actor in a Play, the Outer Critics Circle Award for Best Featured Actor in a Play, and the Tony Award for Best Performance by a Leading Actor in a Play, all for his role in Alan Bennett’s play The History Boys. Film roles include Uncle Monty in Withnail and I. and Uncle Vernon Dursley in the Harry Potter films. His television series include Pie in the Sky and the critically acclaimed version of Bleak House. John Hackney was Chair of the University’s Board of Governors for ten years. Before that, he served as a University Governor for many years and gave outstanding service to the University. He was also Chief Executive of the Tees and Hartlepool Port Authority and Chair of the Post Office Users’ National Council. Stuart was Professor of Sociology at the Open University. He has been at the forefront of social and political analysis for over 30 years and from 1957-61, he was the founder of New Left Review. He then moved into an academic career, using his extensive knowledge to the benefit of various institutions. Bryan (sadly now deceased), a former leader of Hartlepool Council, has made a major contribution to local government. He recently retired as Chairman of North Tees & Hartlepool NHS Trust and is the Chairman of Cleveland College of Art & Design’s board of governors. A former Middlesbrough FC and England player, George (sadly now deceased) began his professional football career in 1937, aged 17, for Middlesbrough; and after a stint in the RAF, he returned to the Boro as captain. During his international career, George was simultaneously captain of Middlesbrough, England and Great Britain. Fred (sadly now deceased) was one of the key members of Teesside's post-war engineering scene. He took over the Teesside based family firm of Harkers Engineering and under his guidance, Harkers is now a world class organisation at the forefront of export, earning the Queen's Award for Industry in the 1990s. Oscar winner Ray is cinema’s premier model animator and fantasy creator. During his amazing career he breathed life into countless creatures and creations including flying saucers, Cyclops, dragons and of course living skeletons, possibly his most famous work from the 1963 film Jason and the Argonauts. His other films include The Seventh Voyage of Sinbad and Clash of the Titans. The one time recluse was radically transformed after TV producer Barry Cockcroft broadcast her battle for survival on bleak Baldersdale. She captivated the nation in the portrayal of her tough and unyielding life in an isolated farmhouse. Since then she has visited many of the capitals of Europe and most recently the United States. Denys joined ICI in 1957 after pursuing a career in Law and was appointed to the ICI Main Board, in 1980 and became Chairman in 1987. Denys is a man with a great humanitarian outlook and international interests, which can be seen through his career. Joe is an Emeritus Professor of the University of Teesside and was previously Head of Instrumentation and Control Engineering. A long term adviser on educational policy, he has made a major contribution to the history of the university. Deidre is Chair of the Commission for Health Improvement, having previously worked as Chief Medical Officer at the Welsh Office – and continues to make a major contribution to health promotion, building on her many publications including the Calman-Hine Report. Alan was born in Northallerton and is an internationally renowned extreme altitude mountaineer. He achieved fame as the first Briton ever to successfully climb all 14 of the world's highest mountains. Ken Home is the Chairman and joint founder of K Home Engineering. He has led a major Tees Valley success story achieving awards such as the Queens Award for Export, Tees Valley Company of the Year (twice) and Tees Valley Exporter of the Year, as well as personal recognition as Tees Valley Executive of the Year. Professor Honeyman is an alumnus of the University, graduating with a PhD, sponsored by the Ministry of Defence. He is Chief Executive of Sheffield Forgemasters. He worked previously at NEI Parsons. On re-joining Forgemasters he led a management buy out and led the company to great success in terms of both reputation and turnover. Alistair is responsible for the Cummins Engine Company Limited in Darlington's European manufacturing strategy and the administration of capital investment projects - a job that has involved him in manufacturing projects in Mexico, Algeria, Pakistan and Russia. In 1984 Sir Alec and his team demonstrated that forensic samples, such as dried stains several years old, contained sufficient DNA to produce conclusive results. He proved that even small fragments of DNA molecules were virtually unique to individuals. He called this process DNA fingerprinting. This changed the face of forensic science and criminal justice throughout the world. Sir Alec is currently the Wolfson Research Professor of the Royal Society at the University of Leicester. David served in the Royal Artillery in the later years of the war before going to Oxford as a scholar at Queen's College. In his distinguished and varied career, he was Professor of Theology and Head of Theology and Religious Studies Department at Leeds University, becoming Emeritus Professor in 1985. Originally from Glasgow, Helena has practised as a barrister since 1972 and was made a Queen's Counsel in 1991. She is a commissioner of the National Commission on Education and is equally well known outside the courtroom as an accomplished commentator and presenter on numerous radio and TV broadcasts. Anna Kennedy is a prominent autism campaigner, drawing on her experience as a mother. She is a former Tesco Mum of the Year and founder of two ASD specialist schools in the UK. Anna originally comes from Middlesbrough. Nas (sadly now deceased) arrived in Britain aged 14 unable to speak English. He went on to become Managing Director of one of the North East’s longest established, privately-owned and independent motor retailers – Jennings Motor Group. Nas has won many accolades including an OBE for his charity work and contribution to the economy, and has been involved in setting up his own charity and fundraising appeal, The Emaan Foundation funded the rebuilding of an entire village in Pakistan following the devastating floods of 2010. Eric Leong is a renowned interior designer in Malaysia and has worked in the industry for over 20 years. He presents a long-running Malaysian television programme on interior design. Eric is known in Malaysia as The Design King and is internationally renowned for the imagination and quality of his work. He has made a major international contribution to design education, including delivering master classes to MA students at our University. He was awarded his honorary degree at a ceremony in Kuala Lumpur. Teesside Graduate Andrew is Head of Character Effects at Dreamworks in the USA. He is the creator of innovative digital effects in Hollywood and has worked on feature films such as Matrix Revolutions and Catwoman. His previous work includes the landmark TV series Walking with Dinosaurs. Andy achieved a master’s degree in computer graphics from Teesside and has gone on to achieve international success in this field. His work has been on the small and big screen in the award-winning Walking with Dinosaurs and The Matrix. While employed by the Framestore studio, he was one of the computer graphics supervisors working on the triple-Oscar-winning Avatar, directed by James Cameron. He now works for The Foundry, a leading UK company for writing software for use in visual effects. Andy first received an honorary Master of Arts degree from Teesside in 2004 and has returned as a guest speaker at the University’s annual international festival of animation and computer games, Animex. Michael came to Teesside in 1972 as Assistant Director (Academic) and took over as Director in 1980. In 1989, Michael oversaw Teesside Polytechnic incorporated as an independent institution and led the institution to University status in 1992. Alasdair is a well-known local businessman and community leader. He is Managing Director of Vauxhall motor dealership Sherwoods of Darlington. In addition to his successful business career Alasdair holds numerous posts in the local community, Chair of the board of governors of Darlington College, Chair of Darlington Strategic Partnership, Chair of Durham School and Chair of St Teresa’s Hospice in Darlington. Alasdair is passionate about his commitment to his community and in 2004 he was awarded an OBE for services to his local community. He is currently the Vice-Lord Lieutenant of County Durham. Wilf (sadly now deceased) is described in Middlesbrough Football Club's official history as "undoubtedly the most famous player in the history of the club". He was born in South Bank and began his career at the age of 14, making his debut in 1936 and joining the Green Howards in 1939. Wilf played for Great Britain during the war and was capped 26 times for England. He is a local legend and a source of huge pride to Teesside. Baroness Masham was made a Life Peer in 1970 and as a committed northerner much of her work involves helping organisations near her home. She is patron of the Yorkshire Red Cross and President of the Yorkshire Association for the Disabled. She took part in the first Paraplegic Olympic Games in Rome in 1960 winning a gold medal and now helps in raising money to support other Olympic competitions. Judge Gillian Matthews is a distinguished local judge. She is a former Recorder and Deputy High Court Judge and currently Designated Civil Judge for Teesside. She is the first ever female QC to come from Middlesbrough and one of only two women in the country to be a Designated Civil Judge. Steve was Manager of Middlesbrough Football Club from 2001 to 2006, giving the role up in June 2006 to become Head Coach of the England Football Team. Under his management Middlesbrough FC won the Carling Cup, qualified for Europe twice, reaching the UEFA Cup Final last season. Steve McClure is one of the best rock climbers in the world. He was born in Saltburn, and has been climbing since childhood. In 2007, he made the first ascent of the UK’s most difficult listed climbing route, named Overshadow, in the Yorkshire Dales. He has charted and pioneered five more of the UK’s toughest routes. Steve climbs and coaches internationally, and writes a blog about climbing. Stephanie is a business journalist for the BBC and is currently the main presenter for BBC Breakfast. She grew up in Middlesbrough and won the Young Engineer for Britain award at the age of 19. Stephanie is also a former champion Irish dancer. Initially formed as the Cleveland String Quartet, they made their debut at Teesside Polytechnic and, as the renamed Brodsky String Quartet, were soon building a reputation for their strong repertoire in the classical field. The Brodsky's were appointed as the first Quartet in Residence at Cambridge University. Peter, educated at St Mary's College, Middlesbrough, spent several years in a monastery before reading philosophy at the University of Paris. He served in the Diplomatic Service and in 1992 he became Chief Executive of Lloyd's and still works in investment banking and securities. Jerzy is Rector of the Krakow Academy of Economics in Poland. He is a senior member of the Polish Academy of Sciences and a distinguished Sociologist and has advised the Polish President on the national and international media. Joe (sadly now deceased) spent a lifetime working for the development and prosperity of the region from the heart of the labour and trade union movements. He was a co-founding Director of the Northern Development Company and spoke for the trade unions in the Invest in Britain Bureau, touring the world to help attract jobs to Britain. Richard is the young highly-renowned authof of Apples, Ten Storey Love Song and, most recently, Kimberly's Capital Punishment. His writing appeared in numerous publications and his books have been translated into nine languages. Richard comes from Middlesbrough and is a leading cultural ambassador for our town. Born in Jamaica in 1938, Bill worked in the engineering industry in Birmingham whilst attending day release courses at Handsworth Technical College. He became the first black leader of a major British trade union and is a member of the executive of the TUC and a member of the Economic Community's Economic and Social Committee. Bob Mortimer is a Middlesbrough born actor and comedian. He is best known for his double act with Vic Reeves through shows like Reeves and Mortimer, Shooting Stars and House of Fools. He owns an independent production company and is recognised as a highly innovative performer, writer and producer. Mo Mowlam (sadly now deceased) was Labour MP for Redcar 1987 - 2001. She held the office of Northern Ireland Secretary and played a crucial role in the Northern Ireland peace talks. She became the first woman to be granted the Freedom of the Borough of Redcar and Cleveland. Mo launched the Tees Valley Information Partnership and officially opening the University's new £11m Learning Resource Centre in 1998. David Muckle is a leading orthopaedic surgeon. He was a member of the team that invented Ibuprofen and author of over 200 published articles. He is medical adviser to many sporting organisations including the Football Association. He is a member of the Research Ethics Committee of the School of Science & Engineering. Geoff is a graduate of Teesside Polytechnic. He started his career with British Steel and progressed to a number of senior positions with different companies in locations ranging from Belgium to Saudi Arabia. He has held a variety of posts within Manchester Airport Group and is currently Group Chief Executive where he has overseen huge growth, diversification and investment. Bill, a Chartered Engineer by profession, he joined the National Health Service in the 1960s. As Chief Executive of South Tees Hospitals NHS Trust he is recognised nationally and internationally as a leader in the modernisation of the health service. Martin stepped down as Chief Executive of Barnados in early 2011. He previously held the post of Chief Executive of the Prison Service and then the National Offender Management Service. Born in Middlesbrough he has, through his work, made an invaluable contribution to education and social inclusion. Julia became the second female Rabbi in Britain at the age of 27. She was the first in the world to have her own congregation and became a media personality. She is an author and lecturer and has served as Governor for the British Institute of Human Rights and is a member of the BMA Ethics Committee. Highly successful local businessman Alan founded his company in 1981 which is now known as Northgate Plc. Northgate now employs 3,000 people across Europe and runs over 100,000 vehicles. He has also made major contributions to our local community, including through his position as a previous Director of Tees Valley Regeneration. Coosje and Claes are internationally renowned sculptors. Between them they have designing over 40 monumental, often controversial, sculptures which adorn parks and town centres in cities across the world. They created the Bottle of Notes in Middlesbrough, which is the first international commission made by the northern region and draws heavily on the heritage of Teesside's most famous son Captain Cook. Adele comes from Stockton and studied English Language and Literature at Leicester University. She has sold over 1.5m copies of her romantic fiction novels in the UK with ten top ten bestsellers. Adele’s books have been translated into over 15 languages and she was official spokesperson for World Book Day in 2006 and 2007. She is also a supporter of numerous charities. David Parnaby is head of the Middlesbrough Football Club Academy. He was previously a teacher at Lingfield Comprehensive School in Darlington and coached England under-15 school boys before joining Middlesbrough FC. He is widely recognised as one of the most talented Academy leaders in English football. Dr Nicholas J. M. Patrick was born in Saltburn-by-the-Sea, North Yorkshire, and is a NASA Astronaut and engineer. He was selected by NASA in 1998, and has flown on two shuttle missions: STS-116 and STS-130, both construction missions to the International Space Station (ISS). He has logged 638 hours in space, including over 18 hours outside the ISS during three spacewalks on his second mission. He is the fourth Briton to have flown in space. Geraldine lectured in Social Administration at Teesside Polytechnic in the mid-1970s. She went on to become Chief Executive of the National Autistic Society and then the Guide Dogs for the Blind Association. Geraldine played an important role on the Social Investment Taskforce and the Strategy Unit's Advisory Group for the Review in Charity Law and Regulation. She was awarded a CBE in the 2001 New Year honours list for services to the voluntary sector. She is now Chair of the Charity Commission and advises the government on a range of charity issues. Harry comes from Middlesbrough. He is a writer on sport – notably the author of The Far Corner (runner up in the 1995 British Sports Book of the Year award) and Slipless in Settle (which won the 2011 Cricket Society and MCC Book of the Year award). Harry has written for the football magazine When Saturday Comes for over 20 years, he is also a former contributing editor to GQ magazine and is sports columnist for the Guardian. Chair of Middlesbrough College, Acklam Grange School and Kader Primary School in Middlesbrough. Hazel has served as a Middlesbrough Councillor for 33 years and was awarded the Freedom of Middlesbrough in 2003. United States-based Steve Penrose graduated in computer science from the University’s predecessor, Teesside Polytechnic, in the 1970s and has achieved the position of Senior Vice-President in ADP. The company has 47,000 staff and is one of the largest providers of integrated computing and business outsourcing companies in the world. Albertjan has pioneered links between European institutions of Higher Education with the Haagse Hogeschool - one of the most influential in the Dutch capital - which has been teaching Teesside Business School's Diploma in Management Studies programme for two years with the links expanding into the field of health related courses. Rhianna is an award-winning writer for games, comics, film, TV and short stories. Her love affair with games evolved through her work as a journalist for PC Zone and The Guardian. She has worked on titles including Heavenly Sword, Mirror’s Edge, Overlord and Tomb Raider. Her work has received awards from the Writers’ Guild of America, the Writers’ Guild of Great Britain, DICE, SXSW and a BAFTA nomination. She is currently writing film and TV projects with the Jim Henson Company, Film4 and O3 Productions. Steve is an alumnus of the University, graduating with a BSc Computer Science. He enjoys building technology companies, such as SurfControl Plc which he jointly founded and guided through hyper growth, eventually employing over 750 people in 14 countries with profitable revenues of over $120m before being acquired in 2007 - Identum, a small spin out from Bristol University which was sold to Trend Micro Inc and more recently he is the co-founder and CEO of the UK digital music company We7, an online jukebox. He was a founder investor in the company with former Genesis frontman Peter Gabriel. Tesco has recently acquired We7. Alan Ransome is one of the leading figures in international table tennis over the last 50 years. He has coached England, won the European Championships with Ormesby, and is a leading local and national coach, organiser of the World Student Games, media commentator and ex-Chairman of the English Table Tennis Association and Chairman of the Commonwealth Table Tennis Federation. He coached the Great Britain team at the 1996 Olympic Games. Edwin (sadly now deceased) was music advisor to Cleveland's Local Education Authority. He studied in Berlin and London before taking up the position. In 1961 he founded the Cleveland Youth Orchestra and had conducted the Teesside Symphony Orchestra since 1960. Marek Reichman is Aston Martin’s design director and has designed some of Aston Martin’s most iconic brands. Marek is a graduate of the University’s BA (Hons) Industrial Design and he regularly returns to the campus to meet and inspire the next generation of design students. He first received an honorary Master of Science degree from Teesside in 2006. Marek Reichman graduated from Teesside Polytechnic in 1989 with a BA (Hons) Industrial Design and went on to achieve an MA Transport Design at the Royal College of Art. Marek’s career began with Rover Group. He then became Senior Designer at BMW Designworks/USA in California. Marek came back to the UK to establish a design studio, went back to the US to work for Ford/Lincoln Mercury in California as Chief Designer, and in 2005 became Director of Design for Aston Martin in the UK. Marek designed James Bond’s new car, the DBS, for the new Bond film, Casino Royale, and met actor Daniel Craig, the new Bond, during location filming in Prague. Tom is a musician, broadcaster and equal rights campaigner. He was raised on Teesside, moving to London to join his first band, Café Society, with Ray Davies of The Kinks and Middlesbrough born songwriter Hereward Kaye. Tom then went on to form The Tom Robinson band achieving a number of Top 20 hits. Singer-songwriter Paul Rodgers was born in Middlesbrough and the founding member and main songwriter of the bands Free, Bad Company and The Firm with Led Zeppelin guitarist Jimmy Page. Since 1968 he has toured internationally and recently as Queen + Paul Rodgers and as a solo artist. He has released 30 albums and sold over 90 million records. He has consistently been voted number one vocalist of all time. He and his wife Cynthia quietly support over 30 varied charities internationally and in 2008 he received the prestigious US Congress Proclamation for his humanitarianism, of only eight awarded. Robert is the former chairman of British Steel and was a member of the British Steel board from 1973 to 1992. He held many posts including President of Eurfer and membership of the ECSC Consultative Committee and has been widely acknowledged for playing a major role in getting British Steel back to profitability in the 1980s. Bill is the founder and Chief Executive of the Wilton Group, the Teesside-based engineering group. The Group was founded in 1994 as Wilton Engineering Services and has massively grown and expanded since then, now employing over 800 people with an annual turnover of over £85m. He was named North East Business Executive of the Year last year and is a major supporter of local charities. Dr John Sentamu was appointed Archbishop of York in 2005 and is the Archbishop for the area in which Teesside University is located. Dr Sentamu is an Advocate of the High Court of Uganda and practiced at the Bar and the Bench before he came to the UK in 1974 to study Theology at Selwyn College Cambridge where he obtained his master’s degree and doctorate. He is an outspoken speaker on a number of issues including modern day slavery, injustice and conflict. John Sergeant is a distinguished television and radio journalist, broadcaster and political author. After Oxford University he started his career by studying journalism at the University’s partner Darlington College. His career highlights include roles as the BBC’s chief political correspondent for eight years and as ITN’s political editor. After retiring from political journalism, his TV appearances have included chairing Have I Got News For You and a surprise stint as a celebrity contestant on BBC One’s Strictly Come Dancing. Professor Abu Shah is the Vice-Chancellor of the University's partner university, Universiti Teknologi Mara (UiTM) - the largest public university in Malaysia and one of the largest universities in Southeast Asia. Professor Abu Shah is a sociologist by background, and a great supporter of the excellent link between the two universities. Dr Shi is the founding President of Hong Kong Institute of Technology, an important partner of Teesside University. She is a major public figure in Hong Kong and a distinguished educationalist. Hannana grew up in the Tees Valley and is the joint co-ordinator of the Southall Black Sisters. This national organisation supports Afro-Caribbean women on a range of major policy issues, including immigration law and domestic violence and campaigns for changes to the law. Bev Skeggs was born in Middlesbrough. She is Professor of Sociology at Goldsmiths College, University of London. Bev is one of the most prominent sociologists of her generation and is the joint managing editor of the 100-year old Sociological Review. Her work is in the areas of women’s studies and cultural studies, as well as sociology. Bev is an elected Academician of the Academy of the Learned Societies for the Social Sciences. Keith Skeoch is the Chief Executive of Standard Life Investments. He has made a huge contribution to the financial services industry, most notably in the wake of the global financial crisis during which he worked with government and trade bodies to establish best practice in stewardship and governance. Keith received his degree in a special event to mark the 450 anniversary of the University’s partner college Prior Pursglove.,Keith Skeoch is the Chief Executive of Standard Life Investments. He has made a huge contribution to the financial services industry, most notably in the wake of the global financial crisis during which he worked with government and trade bodies to establish best practice in stewardship and governance. Keith received his degree in a special event to mark the 450 anniversary of the University’s partner college Prior Pursglove. Wayne gained a Leverhulme Scholarship to the Royal Ballet School aged 12 and has appeared in over 50 major roles. He created numerous dances for his BBC television series The Hot Shoe Show and founded The Wayne Sleep Dance Scholarship to help young aspiring dancers. Rob Smedley is originally from Normanby, Middlesbrough. He has built an outstanding career as an engineer in Formula 1 racing, first with Peugeot, followed by Williams and Jordan. He moved to work for Ferrari in 2007 and later was appointed as Felipe Massa’s race engineer. He is widely recognised as being one of the most respected engineers in the whole of Formula 1. Born in Middlesbrough, Alan has enjoyed an outstanding career as an international football Physiotherapist. In 1994 he was appointed as Physiotherapist to the England team, serving under Terry Venables, Kevin Keegan and Sven Goran Eriksson. Born in Middlesbrough, Harry (sadly now deceased) was Professor of Botany and Director of the Botanic Garden at the University of Leicester - he was one of the lending botanists of his generation and a fellow of the Royal Society. Born in Hartlepool Jeff is a renowned and innovative television journalist. He is best known for his current role as anchor for Sky Sports' Gillette Soccer Saturday. Jeff also presents a range of other live football and has been a well-known face to Sky Sports viewers for over a decade. His media career began as a reporter at his local paper, The Hartlepool Mail. Maurice (sadly now deceased) played a leading role in reshaping local government through his positions as chairman of the Teesside Steering committee during 1966-67, leader of the newly created Teesside County Borough Council from 1967-1974 and mayor. He was a foundation governor of the University of Teesside and was elected to the board in 1989. Rab became the first Chair of Governors for the University of Teesside in 1992, retiring in 1997. His key role in working with senior management turned the University's financial fortunes round from a £1mill a year deficit to a surplus of more than £2million. Alison Thain is the Group Chief Executive of the housing association Thirteen, having previously been Chief Executive of five other housing associations. She has been a Board member of the Regional Development Agency, and is a Board member of the Tees Valley Local Enterprise Partnership, Chair of CBI North East and a Council member of the North East Chamber of Commerce. She was, until this year, a Governor of the University. Eric was born in Hartlepool. Following a period as Dean of the Medical School at Southampton University, he progressed to the role of Vice-Chancellor of the University of Bristol, becoming one of the country's best known and most influential Vice-Chancellors. Mackenzie is a Middlesbrough-born artist with an internationally renowned body of work, drawing on the Tees Valley and the voyages of James Cook for much of his paintings. His most recent exhibition, inspired by Cook, is currently on show at the Captain Cook Birthplace Museum in Middlesbrough. He first received an honorary Master of Arts from Teesside in 2000. Middlesbrough born Mackenzie is an artist of international repute and has held exhibitions in New York, London, Los Angeles and Singapore. He left school at 15 and worked in a series of unskilled, manual jobs until he applied to Middlesbrough College of Art, which led to a Fine Art degree from Byam Shaw School of Art. William Tillyer is a Middlesbrough born artist. He studied at Slade School of Fine Art, University College London and Atelier 17 Studio in Paris. He has exhibited globally including, this year, at mima. He held a Visiting Professorship at Brown University, Rhode Island, USA. Stephen Tompkinson is a Stockton-born actor, and a well-known face in television, theatre and film. He currently plays detective Alan Banks in ITV’s crime drama series DCI Banks. He previously starred in Ballykissangel and Wild at Heart, and his film credits include the 1996 comedy-drama Brassed Off. He regularly performs on the stage in London’s West End. Peter (sadly now deceased) is an acknowledged expert on poverty, health, social policy and old age, with much of this work conducted in and concerning the northern region. He was involved in the foundation of the Child Poverty Action Group in 1965 and also became their president. Tony Waites is chair of the County Durham and Darlington NHS Foundation Trust. He has previously held various Board level appointments in the international textitle industry for almost 40 years and several Board positions in the National Health Service. Tony comes from Darlington. Teesside Industrial Design graduate Dan Walker is a successful concept artist, described by him as the combination of a designer and illustrator. Dan’s talent has been viewed on TV and the big screen, ranging from the two Christian Bale Batman films, to Harry Potter and the Half Blood Prince, The Golden Compass and the 2005 and 2010 series of Doctor Who. This year his work was seen in Ridley Scott’s new version of Robin Hood and the Disney film The Prince of Persia. Pete Widlinski is a long-standing Teesside resident who makes an untiring contribution to the most vulnerable in our society. He is the information and communications manager for the North of England Refugee Service, and was its Tees Valley Area Manager for 14 years. He is also a former secretary of the North East Coalition for Asylum Rights, an organisation he established in 1992 and has kept alive since then. Pete is also a trustee of the Mary Thompson Fund, a body that seeks to alleviate asylum seeker hardship. In addition, Pete is the director and founding member of Justice First, a charity that assists people refused asylum, and a director of Show Racism the Red Card, the anti-racist campaign using football and footballers as positive anti-racist role models. Pete also recently won the Tees Valley BME Awards Lifetime Achievement Award. Teesside born Keith Williams is Chief Executive of British Airways (BA). Keith joined BA in 1998 from Reckitt and Colman where he was head of tax. He became BA group treasurer and head of tax in 2000 and in 2006 he became Chief Financial Officer of BA. He was appointed as Chief Executive in 2011, following him playing a leading role in steering BA through the recession and through the aftermath of the September 11 attacks. Sir Alan went to school in Darlington and is now the Master of Corpus Christi College, Cambridge. Prior to this he was the Director General of Higher Education, the Vice-Chancellor of Leeds University and Assistant Director of the Centre for Environmental Studies. He is a hugely distinguished academic and a passionate believer in widening participation. Dame Penelope was born in Scarborough and has had a successful and varied career in film and television. She has also worked extensively for over 50 years in the classical theatre. Her film career includes roles in The BFG, The French Lieutenant’s Woman, Calendar Girls and Shaun of the Dead. Penelope’s television acting career included several major TV roles starring opposite Richard Briers in Ever Decreasing Circles, playing Homily in The Borrowers and, more recently, for her role as Isobel Crawley in the ITV drama Downton Abbey. In 2015 Penelope won an Olivier Award for her performance in Taken at Midnight. Arnold began his academic career at Manchester University in 1951 moving to the University of Durham in 1956. Although he has retired from his staff post, he is continuing with his research work at Durham and has played a significant role in the north east. Brian (sadly now deceased) joined Middlesbrough Borough Council as Deputy Director of Education in 1970. During his 26 years in educational administration on Teesside, he played a pivotal role in the day to day running of the Polytechnic and was appointed County Educational Officer in 1991. Sir Ian comes from Stockton-on-Tees. He was, until this year, Deputy Chairman of the Government’s Regional Growth Fund advisory panel. He is a former Chairman of the Port of Tyne, former Executive Chairman of UK Land Estates and former Chairman of the BALTIC Centre for Contemporary Art. He is the former Member of Parliament for Teesside Thornaby, and later Stockton South, and has previously served as Deputy Chairman of the University Board of Governors. Phillip is the Chairman of the Yuill Group, a major local employer. He also makes a substantial contribution to the community as the President of the local NSPCC.